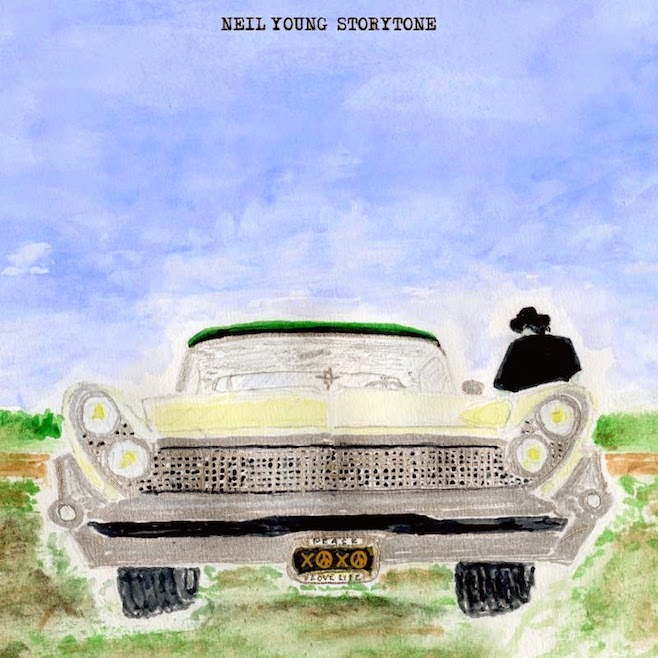 Neil Young what are you doing to us? The legendary artist is releasing a unique album, Storytone (out November 4th). The album's songs are all recorded in two versions. The first version is recorded, mostly, with the assistance of a 92-piece orchestra. The second version of each song is a stripped-down acoustic take. Which version is better depends on which song you're talking about. What's consistent between both renditions is the environmental call to action in the nearly metaphor-free lyrics. Credit must be given to Young for the idea of adding an orchestra to his music. However, the execution leaves a lot (a lot lot lot) to be desired. The opener "Plastic Flowers" is a harbinger of the cheesiness that is to come. Songs like "Glimmer" and "I'm Glad I Found You" sound like the song that ends Act II in a dramatic Broadway musical. And that's not a good thing. "Say Hello To Chicago" could easily be actually from the musical Chicago. Yikes. The one orchestral that does almost work is "Who's Gonna Stand Up?". A strong choir refrain builds nicely...until you pay attention to the ridiculously ham-fisted critique of pipelines and fracking. The fleshed out versions that stand out the most are the electrified blues cuts. "I Want To Drive My Car" and "Like You Used To Do" boast horns, guitars, and harmonica that make them sound like Stevie Ray Vaughn material. The acoustic versions are fairly pedestrian and not noteworthy in comparison. There are a handful of exceptions. The vocal and piano version of "Say Hello To Chicago" sounds like early Tom Waits, while the rootsy steel strum of "Tumbleweed" hits a sweet mark. It was a nice idea, but one that should be left in the waste basket of time. Best tracks: "I Want To Drive My Car", "Say Hello To Chicago (acoustic)"